OK, it’s over and was disappointing. All the speakers are exceptional experts, but I think this casual approach did not work because rarely did we get any of the meaty search information both Matt Cutts and Danny Sullivan generally deliver. If I was making recommendations to SES I would have had each of these folks do separate sessions in their areas of expertise and get into more detail. Matt, for example, is arguably the world’s top search expert and Robert one of the very top experts on blogging and social communities. No need to water their stuff down so much. 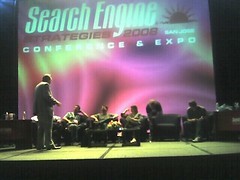 This entry was posted in SES, SES San Jose, Web 2.0 and tagged matt cutts, robert scoble, search. Bookmark the permalink.